Congratulations to Vicky Daniels for winning a copy of Space Between Words. Please e-mail your mailing address to my assistant Christen (amy@triciagoyer.com). 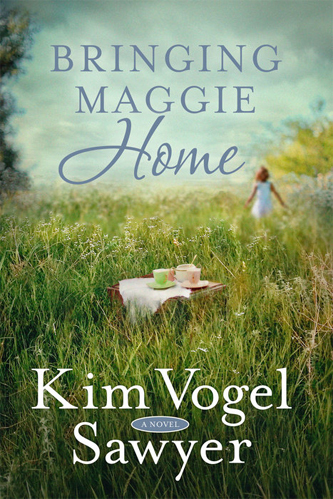 Enter below for a chance to win a copy of Kim Vogel Sawyer’s Bringing Maggie Home! The first book I remember (almost verbatim, even now!) is A Cat Called Cindy, a Tiny Tots Tale told in rhyme. I’ve always loved cats, and the big, black, fuzzy, furry cat in the story captured my heart. I even named our cat Cindy (even though she was NOT a big, black, fuzzy, furry cat). Honestly, I can’t remember when I didn’t want to be an author—I think the desire was born with me—but the first book that let me see what kind of writer I wanted to be was Janette Oke’s Love Comes Softly. I wanted to move a reader the way that story moved me. Iscariot by Tosca Lee. Not an easy, light read by any means, but it was strictly for my enjoyment. And I did enjoy it. Elizabeth Camden’s Beyond All Dreams. It’s our current Lit & Latte (book club) read. You mean other than Bringing Maggie Home? Because I’m pretty hyped about it. *smile* Next March I’m diving back into prairie romance—a mail-order bride story…with a twist. A hoity-toity Easterner will travel to a small Kansas town with the intention of teaching the rough-around-the-edges ranchers how to court their coming brides. Lots of giggles, a few nail-biting adventures, and—of course—the requisite heart lesson in the center of the story. I hope readers will love it. It’s titled Beneath a Prairie Moon. In 1966, Kim Vogel Sawyer told her kindergarten teacher that someday people would check out her book in libraries. That little-girl dream came true in 2006 with the release of Waiting for Summer’s Return. Since then, Kim has watched God expand her dream beyond her childhood imaginings. With almost 50 titles on library shelves and more than a 1.5 million copies of her books in print worldwide, she enjoys a full-time writing and speaking ministry. Empty-nesters, Kim and her retired military husband, Don, live in small-town Kansas, the setting for many of Kim’s novels. 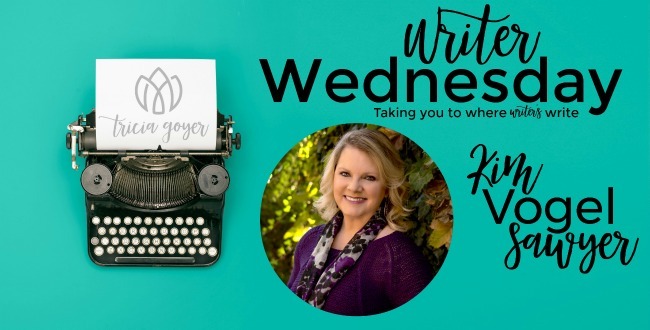 When she isn’t writing, Kim stays active serving in her church’s women’s and music ministries, traveling with “The Hubs,” and spoiling her quiverful of granddarlings. You can learn more about Kim’s writing at www.KimVogelSawyer.com. This looks so intriguing! Thanks for the review and interview. Always fun to peak behind the scenes! Kim Vogel Sawyer is on my Want to Read List! I love her daily devotionals from her blog. Fun interview! I have read a few of Kim’s books and loved them. This looks like such a good book. Both of the books you mentioned have piqued my interest, Kim! I don’t often read about characters who share my name and I’m definitely going to enjoy Bringing Maggie Home. I also love mail order bride books and I always enjoy your books. Be well. Thanks for the interview, blurb, and the giveaway. I haven’t read anything by Ms. Sawyer yet but will have to remedy that soon. I love reading your books and I am really looking forward to reading this captivating and mysterious story. I’m fascinated by the story line of Bringing Maggie Home and look forward to reading it. This book sounds very interesting. Would love to read it. Have a great day. Hi, This book Bringing Maggie Home sounds like one I would like to read. I’ve been reading Kim’s books for several years and always enjoy them. I’m wondering what happened to Maggie.